Star Wars fans may be more familiar with the planet Tatooine than the country of Tunisia: but in reality they are one and the same. Tatooine was the first planet to be introduced in the original movie, Star Wars Episode IV: A New Hope, and of the 10 Star Wars movies made to date four were partially filmed in southern Tunisia. 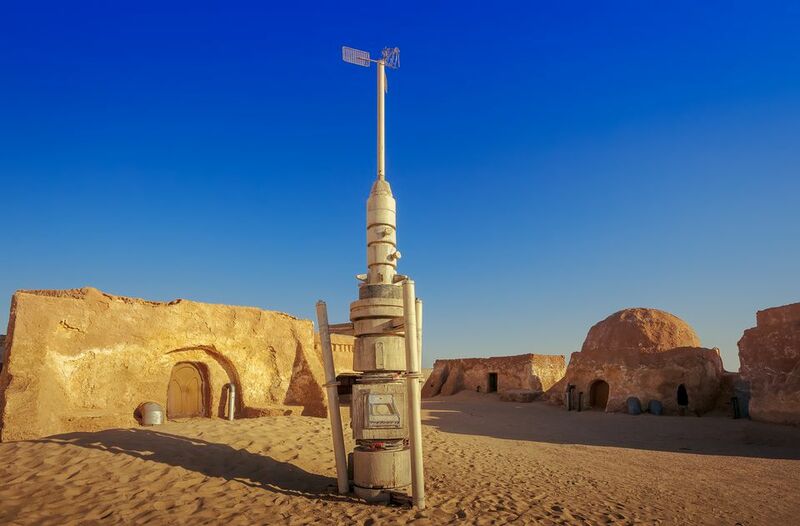 Many of the sets are well preserved and open to visitors, who will recognize them as various iconic Star Wars locations including the Lars Homestead, where Luke Skywalker grew up; and Mos Espa, the spaceport where Anakin Skywalker lived before being discovered by Qui-Gon Jinn. The Berber town of Matmata has several underground troglodyte dwellings, one of which featured in Star Wars Episode IV: A New Hope as the Lars Homestead, where Luke was raised by his aunt and uncle. The same dwelling also appeared in the later film Star Wars Episode II: Attack of the Clones. Today, the homestead has been turned into the Hotel Sidi Driss - an affordable option beloved by Star Wars fans. It has 20 basic rooms and a restaurant, where you can rub shoulders with other film fanatics and admire props taken directly from the movie sets. The Tunisian town of Tataouine is not a Star Wars set in its own right, but it did inspire George Lucas' naming of the Skywalkers' home planet. It's also a great base for a full day of Star Wars sightseeing, since it's located within easy reach of Ksar Ouled Soltane and Ksar Hadada. A Ksar is a fortified Berber village, and both Ouled Soltane and Hadada were used to film scenes in the slave quarters of Mos Espa. Anakin Skywalker lived in these slave quarters with his mother, Shmi, in Star Wars Episode I: The Phantom Menace. The desert town of Tozeur is another great destination with plenty of Star Wars locations nearby. Sidi Bouhlel ravine appears in several scenes from the original Star Wars movie, including the abduction of R2D2 by the Jawas; the wreck of the Sandcrawler after an Imperial attack; and the Tusken Raider attack on Luke Skywalker. The vast salt pan of Chott el Djerid was the site of scenes showing the exterior of the Lars Homestead, and also featured as the final shot of Star Wars Episode III: Revenge of the Sith. Fans will also recognize the area's dramatic desert ridges (known as the Yardangs) as the backdrop of the duel between Qui-Gon Jinn and Darth Maul in Star Wars Episode I: The Phantom Menace. To the west of the Yardangs lies the abandoned Mos Espa set, where the crews from Lucasfilm built much of the spaceport from scratch for The Phantom Menace. The desert sands have encroached upon the set, giving it an eerie atmosphere of abandonment, but landmarks like Watto's shop, Sebulba's Café and the pod-racing arena where Anakin won his freedom are still clearly visible. Located just off Tunisia's southern coast, Djerba Island is home to several Star Wars locations. Head to the coastal town of Ajim to see the buildings used for the exterior shots of the Mos Eisley Cantina, visited by Luke Skywalker and Obi Wan-Kenobi in Star Wars Episode IV: A New Hope. Just outside the town lies an old mosque, which served in the same film as the house where Obi Wan-Kenobi spent his exile. Other Djerba Island buildings also appeared in scenes that were later deleted from the movie, namely as Anchorhead's Tosche Station. Although it is possible to hire a 4x4 vehicle and go in search of the locations listed above on your own, many of them are located deep in the desert and can be difficult to find. One of the best ways for Star Wars fans to experience Tunisia's iconic film locations is to join a dedicated tour like this one offered by Tunisia Tours. Lasting for seven days, the tour takes you to all the most important sets and includes a knowledgeable guide and driver. In between visiting Star Wars locations, you'll have the opportunity to experience other Tunisian sights including the historic medinas of Tunis and Kairouan.